(Nanowerk News) A new material with micropores might be a way to fight climate change. Scientists have created crystals that capture carbon dioxide much more efficiently than previously known materials, even in the presence of water. The research was recently published in a report in the scientific journal Science ("CO2 capture from humid flue gases and humid atmosphere using a microporous coppersilicate "). 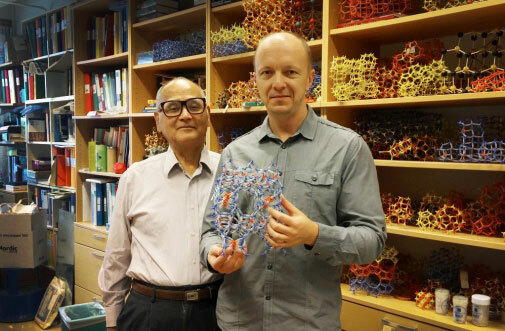 Osamu Terasaki and Peter Oleynikov with a model of the new crystal. One way to mitigate climate change could be to capture carbon dioxide (CO2) from the air. So far this has been difficult, since the presence of water prevents the adsorption of CO2. Complete dehydration is a costly process. Scientists have now created a stable and recyclable material, where the micropores within the crystal have different adsorption sites for carbon dioxide and water. “As far as I know this is the first material that captures CO2in an efficient way in the presence of humidity. In other cases there is competition between water and carbon dioxide and water usually wins. This material adsorbs both, but the CO2 uptake is enormous” says Osamu Terasaki, Professor at the Department of Materials and Environmental Chemistry at Stockholm University. The new material is called SGU-29, named after Sogang University in Korea, and is the result of international cooperation. It is a copper silicate crystal. The material could be used for capturing carbon dioxide from the atmosphere, and especially to clean emissions. “CO2 is always produced with moisture, and now we can capture CO2 from humid gases. Combined with other systems that are being developed, the waste carbon can be used for new valuable compounds. People are working very hard and I think we will be able to do this within five years. The most difficult part is to capture carbon dioxide, and we have a solution for that now” says Osamu Terasaki.